According to records research at the City of Lowell Offices, the H Building and the Executive Building were connected via a three story bridge around 1930. Maps reveal that the H Building was historically occupied by several commercial and light industrial tenants including a bottling works facility, machine shop, candy factory, printing facility, dry goods store, and other commercial and retail businesses. The Vestry Building and Executive Building were historically occupied by a bakery, a residential dwelling, and multiple commercial and retail businesses. 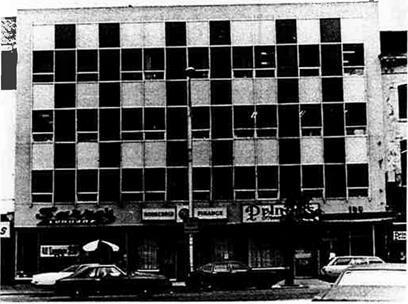 A portion of the H Building was used as a printing facility from circa 1966 through 1969. The Executive Building exemplifies the practice in early twentieth­ century Lowell of linking two or more buildings to form a complex which accommodates the need for larger office and retail space. This "building" is actually three separate structures: It is made up of the copper-clad Lincoln Building of 1923; the adjacent narrow brick Vestry building of circa 1860; and the "H" (for Hosford) Building of 1882. The former two both face Merrimack Street, and the latteron Middle Street is connected to them at the rear by a wide, three-story bridge across the alley. 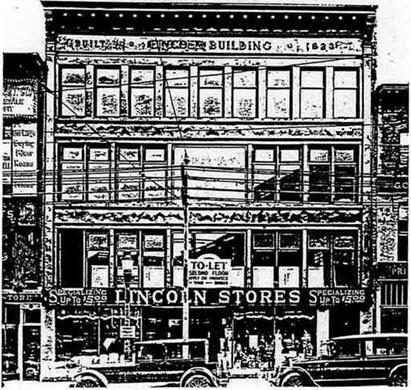 The three buildings were probably joined together around 1930, when the owner of the Lincoln Building, the Lincoln Stores, expanded its real estate holding beyond its original building. The Lincoln Building was among the last commercial building erected in Lowell before the Depression. Known as the Executive Building since 1964, the complex was given an historically sensitive rehabili­tation in 1985-1986. The aluminum and plastic were removed, revealing rem­nants of the mostly stripped copper fa­cade of 1923. Based on photographic and some fabric evidence, the copper facade was redesigned and rebuilt. All­ new copper fabrications and aluminum windows were installed in a similar configuration to the original. Also, the masonry facades of the Vestry and H Buildings were restored, and new wooden storefronts were built. Stylistically this structure may be categorized as Queen Anne. Queen Anne features include the rich brick decoration, variety of window shapes and sizes, and the rising sun motif which appears in the metal panels of the fourth floor windows. On the Middlesex Road side, the date of 1882 appears above the central fourth floor window. Above the date plaque is a small square recessed window. Above this window is a roundel which features the letter "H", for Hocum Hosford who owned this property in 1879.